Are you looking for reliable wine serving equipment for your home or restaurant? Are you looking for the right gift about a special occasion? Tired with using inconvenient plastic pourers that clearly affect the wine taste? Introducing The Ultimate Wine Decanter For Wine Lovers! This handmade wine pourer is 100% lead-free and is crafted with peak-quality crystal glass for a tasteful wine drinking experience. Designed with long neck to provide a breathable surface for your wine in order to aerate and oxygenate it to boost the flavor and scent. Allow your wine to breathe and enjoy the taste like never before. The advanced capacity of 1800ml wine aerator stands out among similar products and allows you to fill it with 2 standard 750ml wine bottles, plus, it provides you with ensured smooth and evenly wine pouring. Additionally, we provide you with a free bonus wine decanter or glass cleaning brush for maximum ease. On the other side, you can save more time when the fun is over and your guests are gone as this crystal wine pourer is entirely dishwasher safe. This elegant crystal wine carafe is the best gift idea for any wine enthusiast, friend or family member and suitable for any occasion. Place Your Order For This Elegant Crystal Wine Decanter While Supplies Last! ✔️ SUPERIOR QUALITY: 100% lead-free, hand-blown crystal glass to provide you with a lightweight carafe that purifies your red or white wine taste and maximizes drinking pleasure. ✔️ FOR EXQUISITE WINE OXYGENATION: Our crystal wine pourer allows the perfect aeriation of your wine, letting it breathe to release its full aroma and rich flavor. Bring your wine drinking experience to the next level with this elegant glass wine aerator. ✔️ LARGE CAPACITY & FINE DESIGN: This 1800ml sleek wine decanter is designed with beautiful curves and 8.5inch wide bottom diameter. When an entire bottle of wine is poured into our decanter, the wine reaches the widest diameter on the decanter allowing for maximum aeration! It is dishwasher safe and features a thin, long neck with slanted spout for comfortable and easy use without spilling accidents. ✔️ EXCEPTIONAL GIFT IDEA: This high-quality crystal carafe is the must-have accessory for any wine enthusiast! A luxurious present idea that will impress any friend or family member that loves wine drinking, suitable for parties, Christmas or any other occasion. 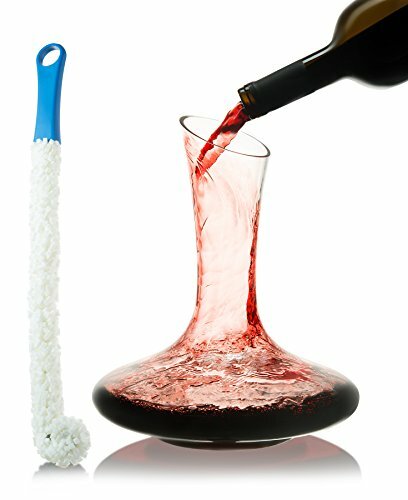 ✔️ PRACTICAL WINE DECANTER SCOURER BONUS: In addition to the top-notch quality wine decanter, you will receive as a free bonus, an extremely useful, durable and lightweight cleaning foam-brush with flexible design and long handle for maximum convenience. If you have any questions about this product by Famaid, contact us by completing and submitting the form below. If you are looking for a specif part number, please include it with your message.